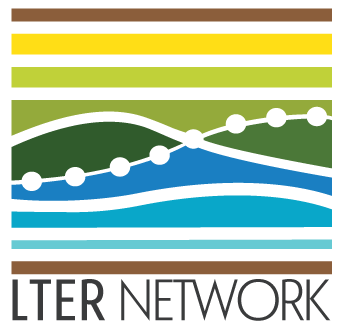 Research Experience for Teachers (RET) opportunities consist of participating in NGA LTER science activities while sailing with researchers on our periodic cruises. Not only do teachers on our cruises actively participate in research activities, they also communicate the experience to their students and the general K-12 community via web-based logs (blogs) and videos. Cruises last 2-3 weeks and occur in May, July, and September. We hope that most cruises in future years will include a berth for a teacher. We particularly welcome Alaska-based teachers. UPDATE: Due to a new partnership with NOAA, 2019 applications for the Teacher at Sea program should now be submitted via NOAA’s Teacher at Sea online application. More information can be found at their FAQ and in our announcement. Katie Gavenus is our NOAA Teacher at Sea for the Spring 2019 cruise. Ms. Gavenus coordinates education programs at the Center for Alaska Coastal Studies in Homer. 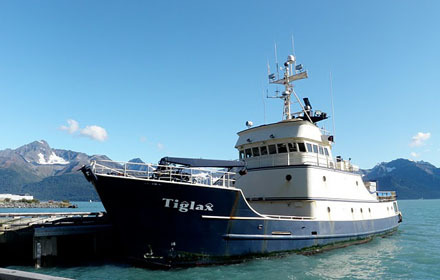 CACS provides guided school field trips at their Peterson Bay Field Station and at the Kasitsna Bay Labs, as well as ship-based oceanography programs on Kachemak Bay. Ms. Gavenus has also been selected by the PolarTREC program to be the educator onboard a MOSAiC project cruise in Fall, 2019. Her logs will be available after the cruise. Mr. Van Arsdale joined us from Eagle River High School, Alaska, where he teaches AP Biology, Forensic Science, Oceanography, and Marine Biology. His participation was made possible though a new partnership with the NOAA Teacher at Sea program, which we hope will continue in the coming years. Mr. Fosstveit joined us from Monroe Woodbury Middle School located in Central Valley, New York. He participated in Seward Line sampling, especially net tows, and kept a log for his class back home. Michele Hoffman Trotter created an educational series of learning modules and interviews of scientists aboard R/V Sikuliaq. Schools in Alaska, California, Chicago, and Canada participated in her lessons. 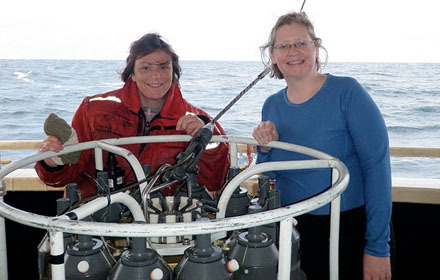 In 2008 and 2009, teachers participated on Seward Line cruises via the ARMADA program at the University of Rhode Island (funded by the National Science Foundation). This program has since concluded. However, the at-sea logs of the teachers are still available. Karen Rudio was a 7th and 8th grade science teacher at Calcutt Middle School in Central Falls, Rhode Island. Read Ms. Rudio’s logs. Jennifer Duncan joined us from from Madeira Beach Fundamental Middle School, a marine theme school in St. Petersburg, Florida. Read Ms. Duncan’s logs.